Grief is not a problem to be solved. It is a process that must be experienced. Human beings are creatures who are at our best when we make connections. Deep in our brains, we have powerful circuitry that craves connection with others. You can see these circuits at work in us as children when we form deep bonds with the people who care for us. Our life literally depends on it. In the scientific world, this is called attachment. Before we can do anything except eat, sleep, cry and poop, these attachment focused parts of our brain are hard at work creating the building blocks for every relationship that we will have throughout the rest of our lives. At this point in our lives, attachment is about survival: form a deep relationship with someone who can keep our otherwise helpless infant body alive. As we grow, we learn about the world and how to relate to it in new ways. We use what we have learned about the relationships with those closest to us – it might help to think of them as templates for relationships – to venture out into the world and form relationships with new people. Safety is still an important goal here, but it’s more of an emotional or intellectual safety rather than keeping predators away. Many believe that when we being to think more abstractly, we can even start to form attachments to complex ideas and concepts. Even though God is not a physical thing or a person that you can see or touch, our brains are powerful enough that we usually imagine God as a person. Usually it’s a father figure – the Bible even talks about God as father. We’re promised that God has our safety, our health, even our prosperity in mind. God seems like someone who really cares about us and it triggers our attachment circuitry pretty hard. We form a relationship with an idea of God that is similar to how we think about parents or lovers or friends. For most people who have not moved, as Richard Rohr would describe, from “order to disorder,” seeing God as supernatural, super-capable male father figure is comforting. When people start deconstructing their faith, what changes about the ways that they think about God? All of a sudden, God may seem aloof, distant, or even disinterested in us. God can appear to be a disengaged parent – or worse. If you, like millions of others, have a mental personification of God, maybe that person even dies. In ways that we usually can’t express, our attachment to God is severed and will never be the same. When you lose something or someone that you love, grief is the natural, human reaction that we experience. We don’t choose it. We don’t have a lot of control to make it start or stop. It is a fundamental, emotional, biological response that our bodies engage. It is not an intellectual activity that we can reason our way out of. Grief is the biological response to attachments that are ruptured and the process of finding new ways to understand the world around us without that important relationship. Something about the world becomes less predictable, less certain, less safe. When your idea of God dies, it is normal to feel sad, scared, angry, exhausted, or alone. A friend who is deep in the process of deconstructing her faith recently told me that she feels like she is in mourning over the loss of God in her life. She often feels like she’s been cheated – that she doesn’t know what in the world she can trust. There is not one thing that I can say or do to take this away from here or to make her feel better. Even if I could, to take away this pain would be to rob her of an experience that will be important on the other side of this when she begins to rebuild what God means to her. All I can really do is to stand with her in solidarity, letting her know that what she is experiencing is normal and that I care. It’s painful – absolutely. Grief can sometimes feel like death, but it is also a sign that you’re alive. When your God dies, grief is your bodies way of telling you this was an important relationship, take some time to learn from it and to allow what it meant to you to settle in somewhere deep. Inside, your mind is already doing the work of reorganizing your attachments, keeping the things that make sense, and making room for brand new ideas. Lean into this grief. When you do, you actually enable this reflective process to do its work. Then, sometime in the future when you’re ready, you’ll realize that you have space for something bigger, more inclusive, more expansive to take the place of what you have lost. During my deconstruction, anxiety was a constant presence. If your ideas about God are dead or on life support, what sort of emotions do you find yourself experiencing? Who are the people in your life that can help you move through this grieving process? Maybe they’re friends nearby or maybe they’re online. Think about the people who you believe won’t tell you that your grief is wrong. Express gratitude for them. You can fight grief, but you can’t fully stop it. Writing and other artistic expressions are great ways to process grief that engages different parts of your brain. As you move through the process of grieving, keep a journal or blog of your experience. Say all of the things that you might never have been allowed to say. Express gratitude for the good things you remember from the relationship. This post is part of a series of reflections that I wanted to create to help people who are deconstructing their views about faith make sense of what they’re experiencing. It can be lonely and scary. But this series is meant to be a safe place to experiment with what it means to go a little deeper. Find the whole series here. 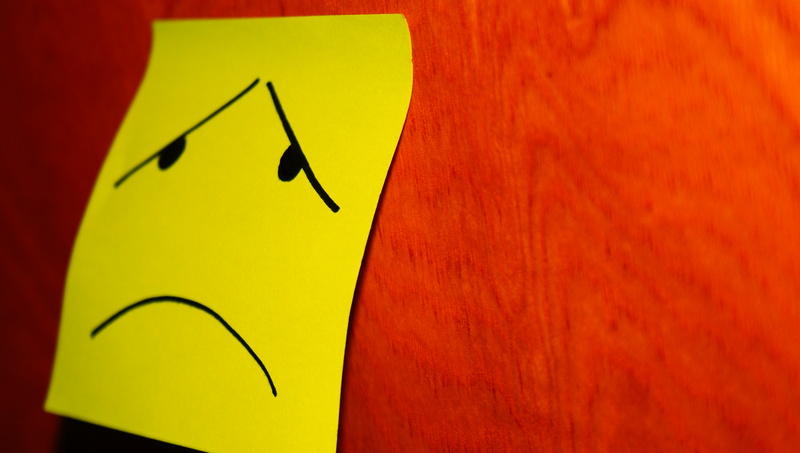 Photo Credit: “Sad” by 0Four is licensed by CC BY-NC 2.0.